Which begs the question: If this is a single barrel and unless the barrel contents were exactly 50 abv, why did they water it down to 50 abv? I like this question. Not just because I know the answer, but because it is always good for me to remember that the audience for this site is not just experienced connoisseurs of bourbon. There are a bunch of people reading this who are just starting out on their bourbon journey. And to them, I say: "Welcome! The bar is in the corner, pour yourself a drink of something nice." Is this really a single barrel bourbon and was the barrel proof exactly 100° proof? Why would they dilute it to 50% ABV if it didn't come out of the barrel that way? "Yes, Rebel Yell Single Barrel is a legitimate single barrel bourbon. ... [We] dump each barrel independently and cut it to 100 proof, it is not a barrel proof product." Single Barrel Bourbon: The product of a solitary barrel of bourbon, that has been dumped independently from other barrels, and then bottled as its own product. Barrel-Proof Bourbon: Bourbon that has not been diluted with water before bottling. Yes, some single barrel products are released at barrel strength. Jack Daniel's has one and most of the Four Roses Single Barrel private picks are barrel-proof. But most single barrel bourbons are not released at barrel-strength. Just think of Blanton's at 93 proof, Jim Beam Single Barrel at 95 proof, Evan Williams Single Barrel at 86 proof, Four Roses Single Barrel at 100 proof, Old Forester single barrel at 90 proof...I could go on and on, but I won't. Let's just keep it simple and say that a single barrel bourbon does not have to be barreled at barrel proof. But as to why Luxco (and every other major producer of Kentucky Bourbon) dilutes their single barrel products? For the same reasons as they dilute all their other products. They either think it tastes best at that proof or they can make more money at that proof. More than likely it is some combination of the two. It tastes good at 90 or 100 proof and they can get more bottles out of a barrel that way. There may even be some tax incentives to bottle it at non-barrel strength. I can assure you, whiskey dilution makes a huge difference in the taste of the final product and companies that are trying to put out a premium product do not undertake it lightly. Do you have a bourbon question you'd like answered? Just get in contact with me using one of the icons in the sidebar to submit one. If I don’t know the answer, I’ll try to find it from someone who does. A few weeks ago, a reader got in touch and mentioned an article about buying and collecting wine. He mentioned it might be interesting to read a bourbon take on that topic. And while I initially thought about doing a guide on collecting bourbon, I realized two things that put me off of it. The first being that I don't collect bourbon. Price and availability took that off the table for me long ago. The second is that there are plenty of "unicorn hunting" tales out there on the internet. Most of them are probably better than I would write. So instead I thought I would offer an insight into how I buy bourbon. Because of the site, I buy a lot more bourbon than most of my non-blogger friends. I buy stuff to review, both "special" and "every day," as well as stuff I just want to have on hand to drink. In other words, I might have a few insights to offer. But don't worry, none of these are rocket science or secret, it's just what I've found to fit my typical needs and budget. Speaking of budgets, if you are going to do some bourbon shopping, you'd do well to have one of them. Bourbon as an impulse buy can wreck your finances fast unless you are independently wealthy or stick to the bottom shelf (neither of which are bad things). I have two different budgets I use when it comes to buying whiskey. One is a standardized Personal Price Ceiling™. My Personal Price Ceiling is the most that I am comfortable spending on a single bottle of whiskey. It allows me to not agonize over those bottles that I know I can't afford. Right now mine is $135, though there are exceptions if I'm on vacation or if I purchased it for a very special occasion. Now that I work on a freelancer's budget though, I hardly ever reach the ceiling. This brings me to my second type of budget. The per shopping trip budget. Before I leave the house, I decide about how much I can afford to spend. I don't always know what I want to buy, but if I can at least know how much I'm willing to drop on the counter, it will help keep me in good standing with my wife/accountant. And it will ensure there is money for the next shopping trip as well. Now, I'm not advocating running all over town every time you want to buy a bottle of Wild Turkey. But it wouldn't hurt to spread that money around a bit. I find that as I visit multiple stores, I get an idea of what each store carries and about what they charge. I know that some stores have a great selection of private barrel picks and that some have rock bottom prices. After a while, you'll learn which stores are knowledgeable, which are staffed by snobs or dicks and which are worth dealing with even if they are snobs or dicks. Don't be afraid to check online for price and availability either, especially if they are across town. These days, your store doesn't necessarily need to be the biggest store to have their inventory or prices online. Of course, there are many reasons why they might choose not to: they might be too cheap to upgrade, afraid of competition, or maybe they are the snobs or dicks mentioned above. In any case, it never hurts to check. 3. Find a retailer that offers samples. Finding a retailer that offers samples is an excellent way to make sure you actually want to buy a particular bourbon. It is especially important if the bottle is a little spendy or if it is a private pick. In my local market, I've got quite a few retailers that offer samples, some are massive chains and some are little one-store shops. Once you have the budget and the stores mapped out, the last thing to do is bring it all together. Did you read about a bourbon that is losing its age statement? At this point, you probably know which stores are likely to have a large supply of it. Pro-tip: if you know that none of the stores in your area are likely to have something, then you can get a jump on asking friends in other markets to grab some for you. This is why I have a case of 6-year-old Heaven Hill Bonded sitting at a friend's house waiting to be picked up. I don't personally collect whiskey, I drink it. That said, it's still ok to stock up. I often have a three bottle buffer of things I particularly like that might not stick around. And like I said, I have a case of age-stated Heaven Hill at a friend's house waiting for me to visit him in Kentucky. Of course, don't be afraid to try something new either. The worst that is going to happen is that you'll use it for cooking or in cocktails. The germ of this article comes from one I originally posted in February of 2013. I think it's time to surface it again. I've cleaned it up a little since I think I've gotten better at writing in the last four years, but the basic idea behind my reviews haven't changed. Everyone who writes about whiskey approaches things differently. Some reviewers like to use numbers. Numbers make a review feel scientific because you've done some math. Some reviewers like to use stars. Stars are easy to visualize and are familiar to Amazon shoppers everywhere. I like to use various cartoon faces and hearts because I'm silly. Probably too silly for my own good. The point is that any and/or all of these are correct. They all adequately represent how much or how little a reviewer liked any given whiskey. But no matter how a writer presents it, we as readers need to remember that the rating is still just a subjective opinion. It probably goes without saying, but I like bourbon. I enjoy it in many different ways. Sometimes I enjoy thoughtfully tasting bourbon. I pour it into a nosing glass, sit down, concentrate, and try to tease out all the little smells and tastes that are hidden inside the glass. And if it is interesting, I'll probably like it. Other times, I want to enjoy bourbon in a rocks glass while playing cards or watching tv or conversing with friends. I'm not paying a lot of attention to it, but if it tastes good and it's acting as a social lubricant, I'll probably like it. Sometimes I enjoy it in a cocktail. Even if it isn't great neat, if it makes a killer Manhattan, I'll probably like it. And if I like it, then I'll tell you I like it. And I'll put a little smiley face next to it. Sometimes I find a bourbon that doesn't taste good and isn't all that interesting. Needless to say, I don't like these. I've gotten pretty good at knowing what I like, and since I buy most of the whiskey reviewed on the site, the odds are that I'm not buying too many duds. But occasionally one slips through, or I buy one specifically for research purposes. When that happens, I'll tell you I dislike it and put a frowny face next to it. Of course, some whiskeys are just...meh. There is nothing offensive about them. They don't taste bad. I don't dislike it, but I don't like it either. It's just sort of in the middle there for me. In such a case I'll just drop a neutral face on it. Very occasionally I'll drop a heart on something. This means I love it. No ifs, ands, or buts. I'd take this whiskey over almost any other. A smiley face means I liked the whiskey or I found it interesting while tasting it. Or I enjoyed myself while drinking it. Or I enjoyed the company I drank it with. Or I was having fun. Most bourbons and ryes will be in this category because, on at least some level, I like most bourbons and ryes I've tasted. A neutral face means meh. I didn't particularly like this whiskey, but I didn't hate it either. It wasn't for me. But you might like it. A frowny face means I really disliked this. I probably dumped it out or at least thought about dumping it out. We all have different life experiences that color our perceptions. I taste JuicyFruit gum when I taste Four Roses. Other people might taste Jackfruit, but I've never had a Jackfruit, so I say JuicyFruit. Some people might taste almond in a whiskey. I'm allergic to nuts, so I only have an academic idea of what almonds taste like. If I use it as a tasting note, it will have come from my wife (we do the notes together). The point is that everyone will like different things and has had different experiences to inform their tastes. And that's pretty cool. It gives us something to talk about. My whiskey is too young, now what? It happens to all of us. Somehow we find ourselves with a bottle of whiskey whose age is listed in single digit months instead of years. Maybe we were given it by a friend. Maybe we were taken in by a pretty label. Or maybe we just weren't paying close enough attention. How we acquired the bottle doesn't really matter as much as what we are going to do with it now. Unless you are a fan of new make, you are probably not going to drink it neat. And unless you plan to use it as a door stop or to clean something, you need to find something to do with it. Well, I can't tell you what to do with yours, but since I found myself with an abundance of the stuff myself recently, I can tell you what I did with mine. But I didn't make whiskey cocktails, well not really. I mean I used whiskey in them. Wait...let's start at the beginning here, and I'll tell you my thought process. I initially thought to myself that if I looked at some colonial-era drinks, well that would be about right since they didn't age the whiskey yet at that point anyway. And while I didn't find many, I did find a couple that worked. The first is one one without a formal recipe. And it takes a couple of months. It's called Cherry Bounce, and I found the process I use in Michael Dietch's excellent book: Whiskey. Basically, you pierce a pound of sour cherries with a knife, toss in a bottle of whiskey, a couple of cups of sugar, some freshly grated nutmeg and a couple of cinnamon sticks. Shake it every few days at first and then let it sit for three months before straining off the liquid. It's damn good, and I think I'll be making some every summer from here on out as if you start it when the cherries are ripe, it is done just in time for the holidays. But I'm guessing you want something you can drink right away, and I won't disappoint. The only other Colonial-era drink I found that worked well with the young whiskey I had was the Whiskey Sling, which has one thing in common with the Bounce above. Nutmeg. It turns out it really does help a young whiskey to be more palatable. A Whiskey Sling is just 2 ounces of whiskey, a half teaspoon of sugar dissolved in a teaspoon of water, a glass, some ice and some freshly grated nutmeg over the top of it all. It really is quite tasty, especially with a young rye. Just try to drink it before the ice melts too much. So after I decided that Colonial-Era drinks were kind of a dead-end, I decided to rethink my approach. To me, whiskey that is too young tastes less like whiskey and more like cheap tequila or rum. And so I decided to treat it that way. The first thing I go to work was a riff on a Margarita. Shake with ice and pour into a glass. You may need to adjust slightly depending on the whiskey you have, but that'll get you close. Following the lime juice and young whiskey theme, a mojito riff worked really well too. Bruise your mint and drop it into your glass, pour in the lime juice, simple syrup, whiskey and a dash of bitters. Give it a stir. Add ice and top with soda water. Branching out a little I also tried a Negroni/Boulevardier with the too young whiskey, and that tasted quite good. I mention Negroni because a Negroni and a Boulevardier are pretty close to the same drink. The Negroni has gin and the other bourbon. In this case, it reminded me more of the Negroni than the Boulevardier. This one is simple. Give it a stir and serve it on the rocks. So after all that I guess my point is that when you have a bottle of whiskey that you aren't sure what to do with, sometimes you need to get creative. I made my bottle disappear by making rum, tequila and gin drinks with it. Maybe you can do the same. What to try when you haven't tried much yet. It's not unusual for people to send me an email me with questions about how they can get started on their bourbon journey. Often, they've dabbled, but are looking to get more serious. With Bourbon, there are a surprisingly significant number of flavor profiles on the shelf. It's weird. Almost all bourbon is made with the same three or four ingredients: corn, barley, and rye or wheat. And yet, the flavors produced range from floral and fruity to spicy and dry with an entire library of flavors in between. I'd say that the quickest way to find out what you like is to try different things. But don't jump straight to the top shelf and only buy barrel-strength bourbons with age statements in the double digits. Don't get me wrong. These are probably very fine bourbons. But I wouldn't start there. First, they are expensive. And if the goal is to try as many as you can, it is helpful if you don't have to miss a mortgage payment to do so. Secondly, if you were to take a big swig of George T Stagg unknowingly, you are probably going to sputter and choke and possibly decide that bourbon is not for you. So, what to do? Well since bourbon has so many flavor profiles, I think that the best idea is to run to the store or your local bar and try some of the delicious, yet affordable offerings out there that show off these distinct flavor profiles. And yes, I've compiled you a shopping list. Due to being owned by one of the largest bourbon producers in the country, this red-headed darling is available at almost every liquor store and bar you'll come across. 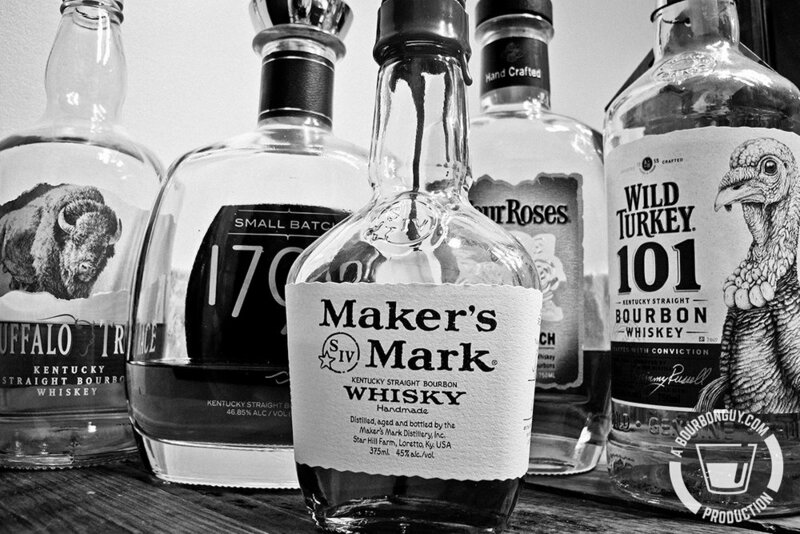 Made with wheat as its flavoring grain, Maker's Mark is a sweet and soft bourbon. It shows caramel, custard, fruit, and baking spice. It's inexpensive, ubiquitous, and very tasty. This is a great bourbon for trying to decide if you like sweeter bourbon flavors. Produced by the Barton 1792 distillery in Bardstown, KY, this bourbon is a great example of a dry bourbon. Dry bourbon is a little different than dry wine, but it follows some of the same ideas. Namely, that sweetness is not the major flavor component. All bourbon is sweet, to an extent, but I find this bourbon brings a lot more peppery heat to the party. It feels like it evaporates in the back of your throat. This is a good one to see if you like drier bourbons and peppery spiciness. When speaking of bourbon, spice can mean two different things. It can mean spicy like the heat of a red pepper or it can mean spicy like the ground spices you put in cookies. In the case of Buffalo Trace, we are talking about the latter. Buffalo Trace bourbon leads with cinnamon and nutmeg flavors before adding in maple and custard flavors. Buffalo Trace is the perfect bourbon to see if you like bourbons that feature baking spice as their main flavor component. Most of the time, floral flavors are a by-product of the yeast used for fermentation. Along with carbon dioxide and ethanol, these little guys create flavor compounds that, if treated nicely, survive through distillation and maturation. Four Roses Small Batch Bourbon is a perfect example of a floral bourbon. Floral and fruity notes start at the nose, mix with sweetness and spice in the mouth and hang around into the finish. If you want to know if you like floral and fruity bourbons, try Four Roses Small Batch. At six to eight years old, Wild Turkey 101 is a good example of what some extra time spent in the barrel can bring you. It is filled with the flavors of sweet caramel, ginger, and oak. Think you don't like the taste of oak? Remember that 100 percent of the color and more than 50 percent of the flavor of a bourbon come from the oak barrel it is stored in. Wild Turkey is a complex, yet inexpensive bourbon, and it is a good choice to see if you like oakier bourbons. So there you have it. Five bourbons to get you on your way. After you identify what you like and what you don't like about each bourbon, then you can start expanding your horizons. And of course, it goes without saying that you should be taking notes along the way. After you've been at it for a while go back and revisit some of the ones you tried early on to see how your palate has changed. I think you'll be surprised to find out that you now like some of the ones you didn't previously or that you don't care for some of those you thought were favorites. And here's the sales pitch. Are you looking for a journal to take your notes in? Well, at BourbonGuyGifts.com I offer hand produced bourbon tasting journals for a reasonable price. Of course, I offer many other hand-crafted items for sale as well.